Creative presents another member of the Pure Wireless family – the ZEN Touch 2 Wireless portable music player. 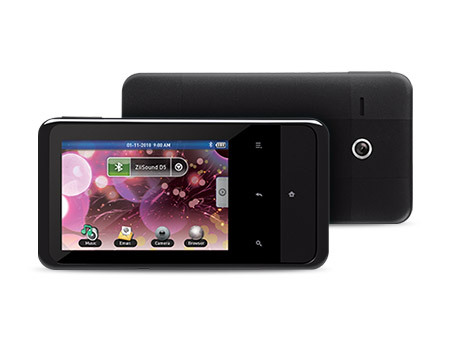 The Zen Touch 2 is more than portable player, it packs a 3.2-inch (480 x 320) touch screen, which supports auto-rotate and double-tap screen zoom features, runs Android 2.1 OS, has a build in Wi-Fi 802.11 b/g/n, web browser, 2-megapixel camera, Accelerometer, microSD card slot, mini USB, 3.5mm stereo jack, Composite TV-out and is available in two version a standard version and an enhanced version that comes with extra GPS, Digital Compass and FM Radio features. The player of course supports popular video formats such as WMV9, SMEG-SP, DivX, 4/5 and XviD (up to 640 x 480 video resolution), as well you can enjoy pure wireless audio streamed to your favourite Bluetooth headphones and speakers.